Welcome to our first October report card! Not a better way to kick off a month than with a win over the gophers. 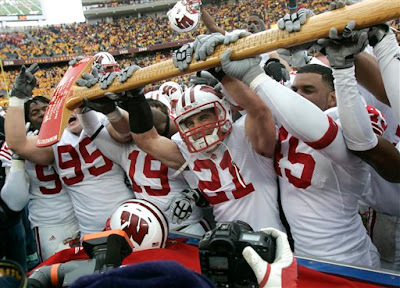 So the axe stays home and Bucky notches win number five. A lot of good in this game but a lot of bad as well, on to the grades. Scott Tolzien didn't have to shoulder as much of the load, and that's the way it should be. He was a true game manager in this match-up. Tolzien threw for just over 160 yards and continued to impress with his accuracy and pocket-presence. He's like Jim Sorgi only we don't expect him to do better than he has so it's alright. But, he did throw an interception. 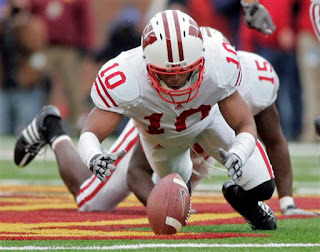 With how close every single game has been for the Badgers those kind of mistakes cannot happen. Still, of the turnovers in the game that one was not nearly as costly as it could have been. How about that bootleg though. Minnesota had no answer for John Clay. He was too big, too fast and too powerful for that defense and it showed. Clay ran for 184 yards, making that three out of the last four weeks that he has run for more than 140 yards. He's good, and he seems to be taking better care of the football after that awful Wofford game. On the other hand, there's Zach Brown, who looks like he's going to be carrying the ball less until he shows better ball security. Brown's fourth quarter fumble put the Gophers back in the game and also made it three straight games that he's put the ball on the turf. That said, Clay was too good to not give Bucky's running backs an A for the game. Garrett Graham and Lance Kendricks might be the best tight end duo in the country. The touchdown catch that Kendricks had was exceptional, you can't do a better job. Also, Graham had another stellar performance, providing Tolzien a go-to target. Wide Receivers were quiet, but drops weren't as noticeable of a problem as they had been the past few weeks. The passing game wasn't as important in this game so it's hard to find fault in lower numbers than normal for guys like Nick Toon and Isaac Anderson. No complaints here, John Clay had big holes and the Minnesota pass rush was fairly ineffective. As the season has gone on, the offensive line has really gotten a lot better. Depth should not be a problem for this unit and as the O-line goes, usually the Badgers go. Getting healthy has done wonders for the Defensive Line. This week we can look past O'Brien Schofield (even though he was terrific as usual) and see heavy contributions from other members of the line. Louis Nzegwu and Patrick Butrym played well, and the Badgers were able to consistently pressure a team for the first time all season. As a whole, the group didn't put the numbers up that they have in past weeks, but Chris Borland's presence on Minnesota's last drive was difference making. 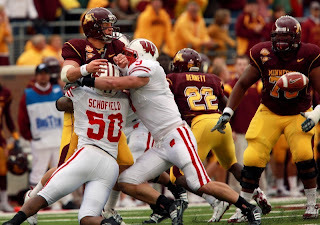 Borland almost single-handedly pressured and disrupted the Gopher rally. Had Mike Taylor's interception not been called back due to penalty this group would probably be getting an A. Overall though a very, very good performance from the 'backers, especially the two true freshman, Borland and Taylor. It's not a better grade because Eric Decker absolutely lit-up Bucky's defensive backs, but the Badgers aren't the first team he's done that to and they won't be the last. It's not worse because besides Decker, the Gophers receivers really didn't have an impact on the game. The Badgers still lack a clear number one corner but the group of Antonio Fenelus, Devin Smith, Niles Brinkley and Aaron Henry seems to be improving. More improvement will be needed if Wisconsin wants to have any chance against Ohio State next week. They won, and at the end of the day that's all that really matters. But for the second straight week, the Badgers had their opponent beaten and were in control only to allow them back into the game. This time it was Zach Brown's fumble that was returned for a touchdown. Last year the Badgers lose this game, this year they win. But if they get a lead against Ohio State and can't put them away, they will lose. You can't let good teams hang around and give them chances to beat you, maybe Minnesota and Michigan State won't come back but the Buckeyes will, Iowa will. It's the difference between fourth place and a Big Ten title.